Figure 10-2. Departure procedure (DP). 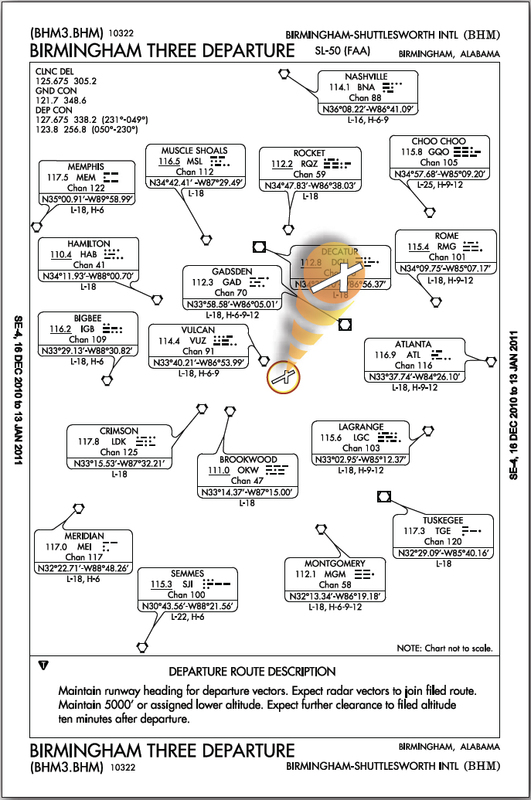 There are two types of DPs: Obstacle Departure Procedures (ODP), printed either textually or graphically, and Standard Instrument Departures (SID), always printed graphically. All DPs, either textual or graphic, may be designed using either conventional or area navigation (RNAV) criteria. RNAV procedures have RNAV printed in the title (e.g., SHEAD TWO DEPARTURE (RNAV)). ODPs provide obstruction clearance via the least onerous route from the terminal area to the appropriate en route structure. ODPs are recommended for obstruction clearance and may be flown without ATC clearance unless an alternate departure procedure (SID or radar vector) has been specifically assigned by ATC. Graphic ODPs have (OBSTACLE) printed in the procedure title (e.g., GEYSR THREE DEPARTURE (OBSTACLE), CROWN ONE DEPARTURE (RNAV)(OBSTACLE)). SIDs are ATC procedures printed for pilot/controller use in graphic form to provide obstruction clearance and a transition from the terminal area to the appropriate en route structure. SIDs are primarily designed for system enhancement and to reduce pilot/controller workload. ATC clearance must be received prior to flying a SID. ODPs are found in section C of each booklet published regionally by the AeroNav Products, TPP, along with “IFR Take-off Minimums” while SIDs are collocated with the approach procedures for the applicable airport. Additional information on the development of DPs can be found in paragraph 5-2-7 of the AIM. However, the following points are important to remember. The pilot of IFR aircraft operating from locations where DP procedures are effective may expect an ATC clearance containing a DP. The use of a DP requires pilot possession of at least the textual description of the approved DP. If a pilot does not possess a preprinted DP or for any other reason does not wish to use a DP, he or she is expected to advise ATC. Notification may be accomplished by filing “NO DP” in the remarks section of the filed flight plan or by advising ATC. If a DP is accepted in a clearance, a pilot must comply with it. On IFR departures from airports in congested areas, a pilot normally receives navigational guidance from departure control by radar vector. When a departure is to be vectored immediately following takeoff, the pilot is advised before takeoff of the initial heading to be flown. This information is vital in the event of a loss of two-way radio communications during departure. A radar controlled departure does not relieve the pilot of responsibilities as pilot-in-command. Be prepared before takeoff to conduct navigation according to the ATC clearance with navigation receivers checked and properly tuned. While under radar control, monitor instruments to ensure continuous orientation to the route specified in the clearance and record the time over designated checkpoints. When departing from airports that have neither an operating tower nor an FSS, a pilot should telephone the flight plan to the nearest ATC facility at least 30 minutes before the estimated departure time. If weather conditions permit, depart VFR and request IFR clearance as soon as radio contact is established with ATC. This would authorize departure within the allotted period and permit a pilot to proceed in accordance with the clearance. In the absence of any specific departure instructions, a pilot would be expected to proceed on course via the most direct route.